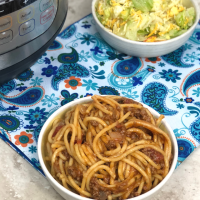 This Instant Pot Spaghetti will amaze you with the beautiful blend of flavors and ease of cooking. 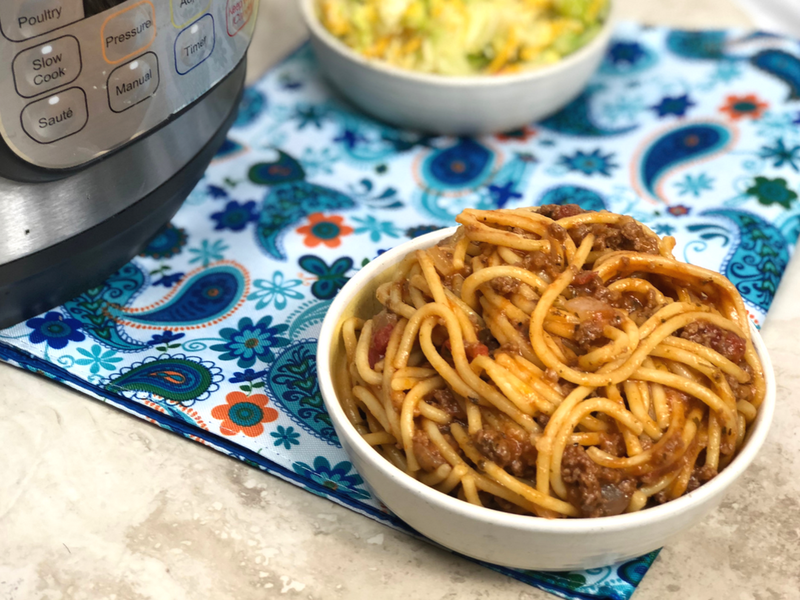 Pressure cooker spaghetti is a simple one-pot meal that your family will love! 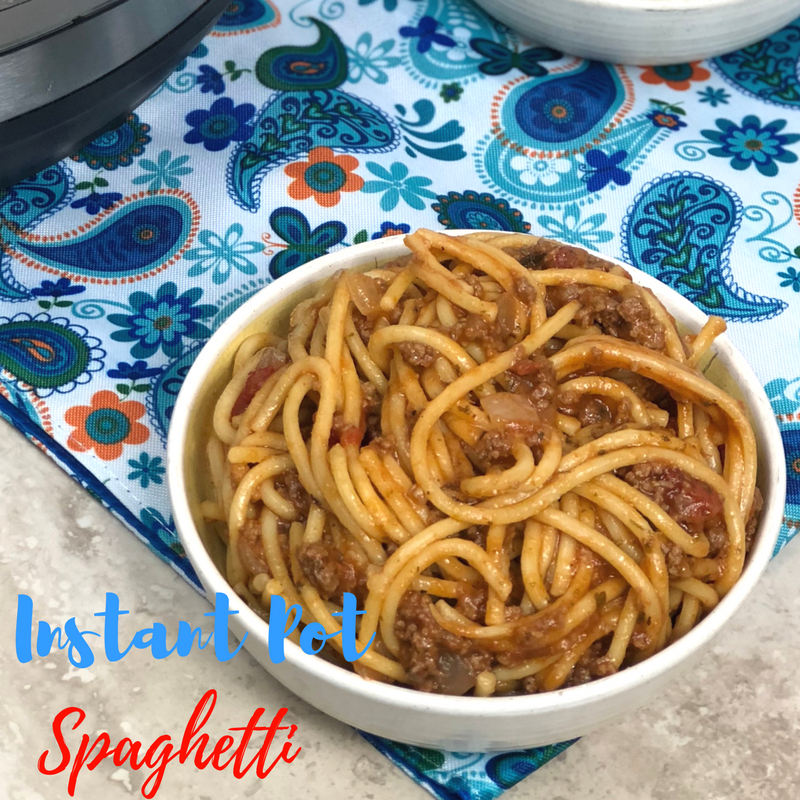 No more having a pot of boiling water for noodles, pan for meat sauce, and a ton of dirty dishes to have an amazing spaghetti in your instant pot, check out this awesome Instant Pot Chicken Parmesan too, I promise you will love it. With your nifty Instant Pot you can do it all, and have dinner ready to be served a lot faster than the traditional route of cooking. 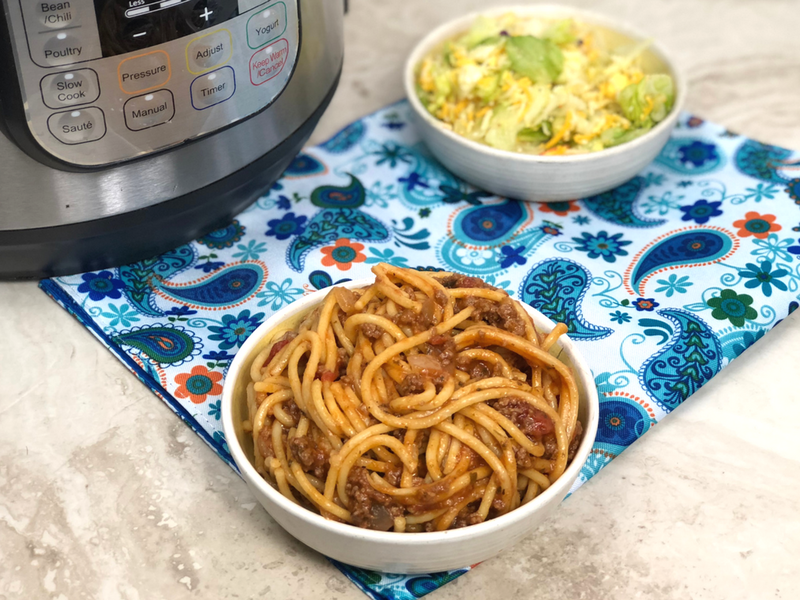 Serve this pressure cooker spaghetti up with a crisp green salad, garlic bread, and you have a simple dinner that everyone will enjoy, and the leftovers are quite a treat as well. I am sure there are Italians out there shaking their heads at this Instant Pot Spaghetti recipe, but let me tell you what. 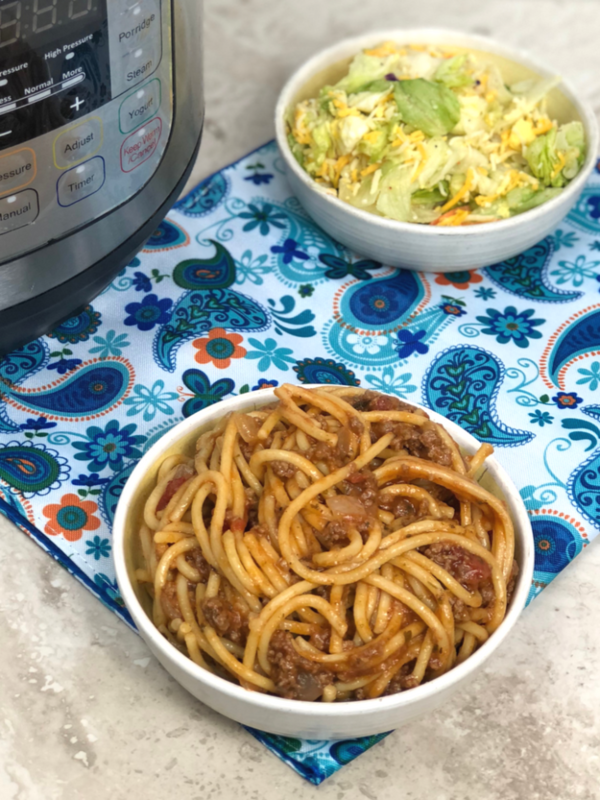 This pressure cooker spaghetti really brings the dish together and the noodles are flavorful, the meat sauce is perfect, and I bet even an Italian would gobble this right up without hesitation. As a single mom to three kids, I need quick dinner options, because this mom is always busy doing something. I don’t have time to spend extra time in the kitchen and cooking ground beef cooking ground beef in this thing is great! You are welcome to use any type of spaghetti noodles you like, whether they are veggie, whole wheat, or the classic kind. Each brand and style have turned out great in this recipe. You can also substitute the ground beef for ground turkey or even pork if you want. It is totally about the preference of flavor of what you have on hand. We love hamburger in ours, but you are welcome to switch things up, it will still turn out to be one savory dish. Lastly, as for spaghetti sauce, use whatever brand you like, or if you would prefer homemade Mom’s Sunday Sauce is a great recipe for the Instant Pot. I like to tell people to buy the sauce they prefer. I know in our home we have two or three kinds and those are what we stick with. Every time I venture out I normally go back to wanting my old spaghetti sauce. So pick out whatever brand you generally buy. How do you cook spaghetti in the instant pot? Simply turn your Instant Pot to saute and toss in your onions and garlic. Cook until you can begin to smell the aroma, and then toss in the ground beef, salt and basil and parsley. Cook it until it is no longer pink. Then you want to drain out any grease, if you buy lean you can skip this step, but this helps it from becoming too greasy with less lean meats. Next toss in your broth, tomatoes, and sauce and noodles. Make sure your noodles are covered in liquid or they will not cook properly. Then set your Instant Pot and let it cook away. Perfectly easy to make and quick. Two things I love and the flavor of this spaghetti is absolutely delicious. I am a huge fan of making spaghetti in the pressure cooker, and will never look back at my old ways. I hope you all enjoy this recipe if you give it a try! Can I cook pasta in my instant pot? Yes! Here are some more great Instant Pot Pasta Recipes! How long do you cook spaghetti in instant pot? Cook till no longer pink, chopping to break the meat up as you go. Pour in the sauce, tomatoes, and liquid. Make sure your noodles are completely covered. Place on and lock the lid, close the valve and press manual high pressure for 8 minutes. So easy and so good! Thanks for this recipe. It’s going to be my go-to from now on. The only thing I changed was using Italian seasoning in place of the basil and parsley since I think both are in Italian seasoning plus we like oregano. Outstanding! Used White Chop Turkey instead of beef, and only used 1/2 box of spaghetti and decreased the broth. I big hit, very easy and flavorful. There is no need for oil. 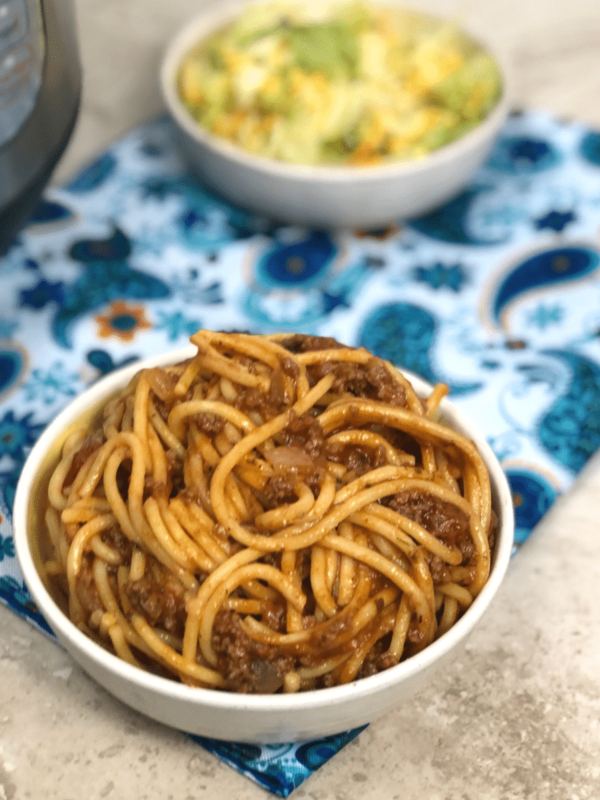 I just made this spaghetti with meat sauce recipe and it tasted delicious! I like that you use the entire box of spaghetti. Many recipes only use half a box. I added two tablespoons of cream cheese to thicken up the sauce and it was perfect. I will definitely make it again! I am a beginner. I made this tonight and it turned out perfect!! Thanks so much for posting and the easy directions! box of rotini instead of spaghetti noodles. It was delicious! I made this recipe and used a 16oz. box of rotini pasta instead of the spaghetti pasta. The rotini really soaked up the sauce and the meal was delicious. Thank you for a great recipe! My angel hair noodles clumped together. How do I prevent that? I’m not sure, I use spaghetti noodles.